Have you ever wondered about how to connect with your Spirit Guides? = If you have, you’re in the right place. And if you haven’t, why not? It’s fun. They can help with anything. If it’s important to you, it’s important to them. Scroll over the image to save it to Pinterest! Connecting with your Spirit Guides is a lot like learning to cook an artichoke. At first, you have no idea what you’re doing. It seems overwhelming and complicated. Do I broil this thing? Bake it? I have to snip the tips… whaaat? But if you stick with it, you get the hang of it. 1. Create a sacred space for connecting. Select a place where you can hang out with your Guides on a regular basis – a comfy recliner, yoga mat, or a bench at the park. You can connect with them anywhere, but it’s helpful to have a special place when you first start out. Why? Because you are “training” yourself to relax (and your vibration to raise), making connection easier. So, have a seat in your sacred space and chat with your Spirit Guides. You can also chat with them through journaling so you don’t feel weird talking to yourself! 2. Invite them in. Your spiritual team is always there to support you, but why not invite them into your life and make it official? Simply set the intention that you want them to be a part of your life. When you need guidance, ask them for support. Then, watch for signs, or notice what feelings you get. 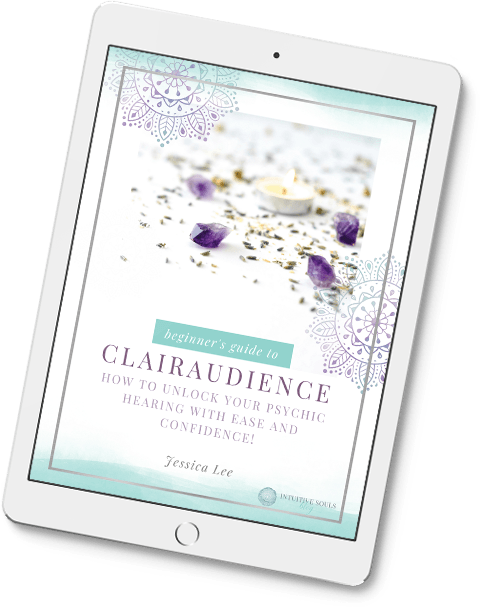 This fabulous post will help you develop your psychic ability and chat with your guides, effortlessly! 3. Ask for signs. I know it can be hard to trust your Spirit Guides, especially when you’re a newbie. Plus, they’re invisible, so there’s that. That’s why it’s helpful to ask for signs. Signs help build trust. In a song, a blog post, or the next words your best friend utters to you. The sky is the limit! Example: The other day I was overwhelmed because I didn’t know which art print to buy for my spare room. I looked at a LOT of art. (So much beautiful art on Etsy, so little wall space!) I narrowed it down to four choices, and my husband wasn’t very helpful, so I turned to my Guides instead. An hour later, I shrieked when I saw one of the prints featured in a decorating magazine! Yep, that’s a sign, people. 4. Meet them in dreams. We’re more open to the spirit world during sleep than any other time. Tonight, before you fall asleep, ask your Spirit Guides to connect with you in dreamland – then trust that they will. Ask for their guidance on a specific issue. Should I start that new business? Go back to school? Paint my armoire red? Easy. Peasy. You might not consciously remember a dream, but you might wake up with an inspired idea. Inspired ideas are spiritual guidance. 5. Be open. Try not to expect your Spiritual Guides to “show up” in a certain way. Just go with the flow. If you expect them to come to you ONLY in dreams, for example, you might miss a lot of the good stuff during the day. 6. Call in ANY Spirit Guides you want. We have a main guide that sticks with us for life, as well as other guides that come and go. Plus, we can call in specific Guides any time we want! Um, how do I cook an artichoke? Can a cooking guide please help a gal out? 7. Journal with them. What issue are you dealing with right now? Write the issue/question down on a piece of paper. Now set the intention that your Spirit Guides will give you guidance via inspired writing. Pick up your pen, let your mind go free, and write, baby, write! Don’t worry about grammar or spelling – just go man, go. You may get a detailed solution or a starting point. If you don’t like to write, journal by typing on your laptop or iPad. 10. Create with them. I believe creating is as important to our souls as exercise is to our bodies. It’s also one of the BEST and most FUN ways of getting in touch with our Spirit Guides and Higher Self! When we get creative, we let go of our inhibitions. We feel inspired and playful and follow our hearts. Plus, it makes us happy, which raises our vibration. And because Spirit has a high vibrational frequency, raising OUR vibration makes it easier to connect with them. So go ahead and spend time drawing, painting, singing, knitting, woodworking, or whatever you think of as creative. 11. Practice a Q&A reading for yourself. Sit where you won’t be disturbed for 10-15 minutes. Relax. Call your Spirit Guides in. Don’t worry if you don’t know their names. Just imagine their energy coming close. Ask them a question that starts with “Why,” or “Should.” For example, Why am I afraid to_______? Why am I having trouble deciding on ___________? Should I ____________? Listen to the answers. They may just “pop” into your head, or you may get a vision, or have a feeling. 12. Call upon them when shopping, driving, or looking for a lost object. Lost your car keys? GPS on the fritz? Ask your Spirit Guide for help. 14. Listen to your gut. Have you ever had a feeling that something wasn’t as it should be? Sometimes it’s so strong it’s almost a physical sensation in your stomach? It seems like when my gut is telling me something, it’s something I need to know right away. Like the other day, when I was at the store and had a strong urge to zip up my purse. I looked over and sure enough, my purse is wide open with my checkbook hanging out! Jeez! I knew this info was coming from my Spirit Guides because it was so sudden and intense. Plus, my mind was a million miles away from my purse, as I was trying to pick out a new lamp – so I knew it was my Guides. BTW, if you get lots of gut feelings, you’ll want to read this post about claircognizance (psychic knowing). As with all spiritual things, the most important points are to ask for what you need (set your intention) and trust that it will be given to you. Your Spiritual Guides are just waiting to help you! Ever Wonder if Spiritual Guides are Real? I will be the one to build you up, or I will be the one to never doubt, and my favorite two, I will be the to hold your hand and I will be the one to understand. You always have so many good ideas and things to say and I so try a lot of them!!!! I just wanted to say that I asked my guide to show me truly what the name was that I was told. As I sat on my swing on my porch, something told me to look up and I did. There was a bee that was walking around on my canopy and I didn’t understand why it kept doing that so I watched closely and it was spelling out my guides name. I GOT IT!!!!! So now I believe and I look for clues in everything if I ask a question. I love the different ways to communicate with our Spirit Guides! There are a few I haven’t tried, so I’m excited to “Mix it up”. I’ve been lucky enough to meet with a few guides in my dreams, where I became lucid for a short time. Those experiences were very profound and eye opening! Your guides are truly always cheering you on!